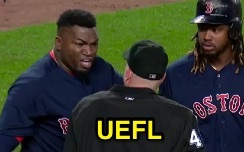 HP Umpire Ron Kulpa ejected Red Sox Manager John Farrell and DH David Ortiz for arguing strike calls in the top of the 9th inning of the Yankees-Red Sox game. With one out and the bases loaded, Ortiz took two consecutive 3-1 sliders from Yankees pitcher Andrew Miller for called second and third strikes. Replays indicate the 3-1 pitch was located over the outer edge of home plate and knee high (px -.730, pz 1.894 [sz_bot 1.79]), the call was correct. Replays indicate the 3-2 pitch was located over the outer half of home plate and below the hollow of the knee (px -.445, pz 1.332 [sz_bot 1.790 / MOE 1.707]), the call was incorrect. At the time of the ejections, the Yankees were leading, 3-2. The Yankees ultimately won the contest, 3-2. These are Ron Kulpa (46)'s first and second ejections of the 2016 MLB regular season. Ron Kulpa now has 3 points in the UEFL Standings (1 Previous + 2*[2 MLB] + 2 Y - 4 N = 3). Crew Chief Jerry Meals now has 2 points in Crew Division (1 Previous + 1 Correct Call + 0 N = 2). *David Ortiz was named MLB's leading hothead player in a June 2015 study of ejection rates. These are the 25th and 26th ejection reports of the 2016 MLB regular season. This is the 12th Manager ejection of 2016. This is the 14th player ejection of 2016. Prior to ejection, Ortiz was 1-5 (SO) in the contest. This is the Yankees' 1/2nd ejection of 2016, 1st in the AL East (BOS 2; BAL, NYY, TB, TOR 1). This is John Farrell's first ejection since June 23, 2015 (Tim Timmons; QOC = N [Balls/Strikes]). This is David Ortiz's first ejection since June 20, 2015 (Bruce Dreckman; QOC = U [USC-NEC]). This is Ron Kulpa's first ejection since August 23, 2015 (Jeff Banister; QOC = U [Arguing Ejection]).